Terry Gilliam’s engrossingly meandering fantasy, as visually rich as you’d expect from the director of Brazil and Twelve Monkeys, returns to the director’s favourite theme of redemption through the potency of the imagination. Too much for a single viewing. 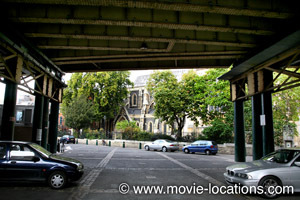 Set in a mostly benighted London, by turns, magical and mundane, the film introduces the travelling show of Dr Parnassus (Christopher Plummer) beneath the rail tracks on Green Dragon Court in Borough, SE1, where an obnoxious drunk discovers the rickety set-up is more mysterious than it appears. 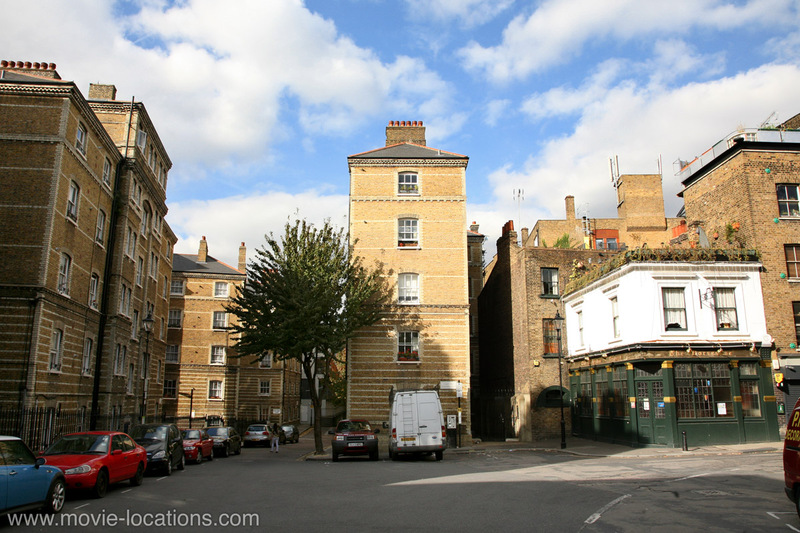 The site is alongside Southwark Cathedral and Borough Market, immediately behind the Globe pub above which Bridget lives in Bridget Jones’s Diary. The show moves to a fairground at the southern end of Tower Bridge, alongside City Hall, where this time Anton (Andrew Garfield) manages to rescue a stray kid from the sinister mirror. 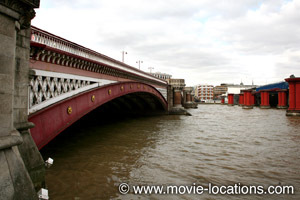 The enigmatic Tony (Heath Ledger) is discovered hanging beneath Blackfriars Bridge, crossing the Thames just west of the Tate Modern. He was not the first person to be found hanging here. In 1982, Italian banker Roberto Calvi (dubbed ‘God’s banker’ because of his ties to the Vatican) was found hanged below one of its arches. Initially dismissed as suicide, his death is now regarded as murder – and the murky circumstances surrounding his demise inspired the plot of The Godfather Part 3. Tony is somewhat luckier, finding himself adopted by Dr Parnassus’s band. 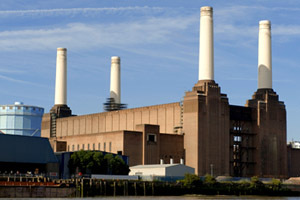 The industrial site in which he recovers, and where the Imaginarium spends most of its time during the day, is the interior of the old Battersea Power Station, on the south bank of the River Thames to the southwest, across from Pimlico. This should have been quite familiar to Heath Ledger, as it’s one of the few non-Chicago locations used in The Dark Knight. Surprisingly, the building consisted of two separate power stations – one built in the early Thirties, the other in the Fifties – together making the largest brick building in Europe, and one of the most recognisable London landmarks. Early in its life, it appeared briefly as a target for terrorists in Alfred Hitchcock’s 1936 Sabotage. It was closed and gutted in 1983, since when the many plans to turn it into a theme park or leisure centre have fallen through, though it’s found steady use as a film location. Its dilapidated railway station was one of the shabby backdrops to Michael Radford’s grim 1984 film of George Orwell’s novel Nineteen Eighty-Four, as well as hosting the climactic ‘Battle of Bosworth’ in Richard Loncraine’s adaptation of Richard III, with Ian McKellen. The rubble-strewn interior was one of the murder sites in George Sluizer’s Crimetime, and it’s also where Hugh Laurie and Tom Hollander confront the BBC man in the 2000 comedy Maybe Baby. And although the ‘Ark of the Arts’ in Alfonso Cuarón’s Children of Men is filmed inside the other great London power station, Bankside (now Tate Modern), the exterior shots are of Battersea – with its own Thames bridge added digitally. The power station returns to the screen in Guy Ritchie’s RocknRolla. 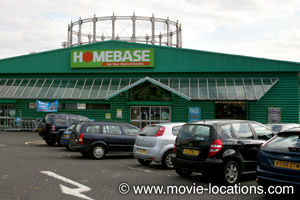 As Tony begins working as a barker for Dr Parnassus, he recruits an audience way up in north London, from DIY store Homebase, 3 Station Road, south of New Southgate rail station, New Southgate, N11. There’s trouble for the show at Clerkenwell Close in Clerkenwell, EC3, opposite The Horseshoe pub, as the Imaginarium makes a hasty exit with cannons firing. Just off the close, you’ll find the alleyway in which the gang switches cars after the jewellery heist in A Fish Called Wanda. The revamped and redesigned show opens to great success with the ladies in Leadenhall Market, off Gracechurch Street, EC3, beneath the famous Lloyds Building in the City of London. Dating from 1880, and built on the site of an ancient poultry fair, the brightly-painted, wrought iron arcade was featured in the 1977 John Wayne film Brannigan, in Lara Croft: Tomb Raider and in Green Street. 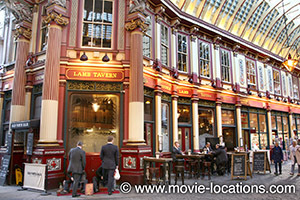 The market also hides the entrance to The Leaky Cauldron in Harry Potter and the Sorcerers Stone. Fantasy sequences were filmed at the Bridge Studios in Burnaby, east of downtown Vancouver, British Columbia. From 1930, this was the Dominion Bridge plant, manufacturing steel structures (including parts of San Francisco’s Golden Gate Bridge) until, in the mid-Seventies, disused parts of the plant were leased out for filming. Since 1987, it’s been a permanent film studio hosting productions including Juno, Night at the Museum and Jumanji. And it’s in Vancouver you’ll find the film’s last two spectacular locations. 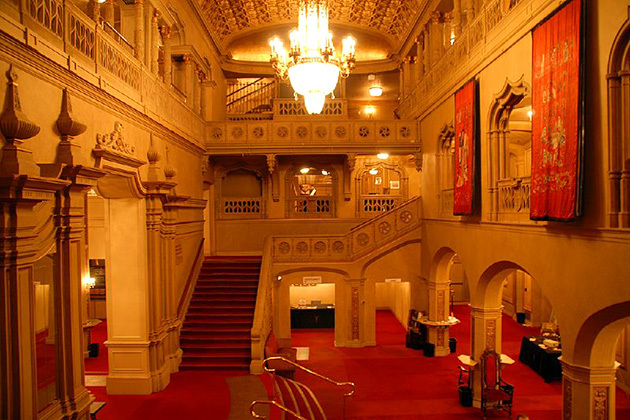 The imposing theatre, in which Tony 3 (Colin Farrell) attends the disastrous children’s charity bash, is the Orpheum Theatre, 884 Granville Street at Smithe Street, Vancouver. Built in 1927 as a movie theatre in the grandiose Moorish style, the Orpheum narrowly escaped being chopped up into a multiplex cinema in the late Sixties-early Seventies, and a ‘Save the Orpheum’ campaign has seen it it restored to become a concert hall. The Orpheum was recently featured in TV series Battlestar Galactica, and as the picture house where Edward Cullen briefly indulges his bloodlust in the flashback scenes of The Twilight Saga: Breaking Dawn Part 1. 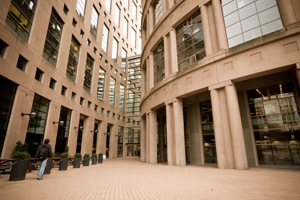 The huge, glass-roofed shopping mall, outside which Parnassus is reduced to begging, and inside which he catches a glimpse of his daughter’s future, is the Central Branch of Vancouver Public Library, 350 West Georgia Street, just a couple of blocks east of the Orpheum. 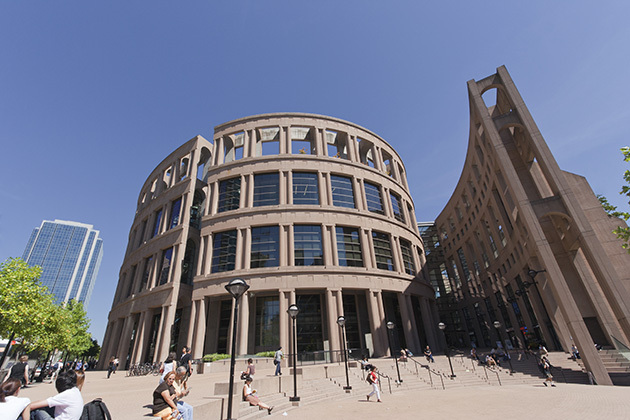 Opened in 1995, the library is a seven-story rectangular box (which contains the actual book stacks) surrounded by a free-standing, elliptical wall housing reading areas, which is accessed by bridges spanning the light wells. The curved arcade, featured in the film, is the library’s entry foyer.